DeltaTrak will be featuring the next generation FlashLink Real-Time Mini Loggers at Fruit Logistica 2019, Hall 23 / A-17, from February 6 to 8, 2019, at the Berlin ExpoCenter City, Berlin, Germany. The next generation FlashLink In-Transit Real-Time Mini Logger offers an extended battery life and is a cost-effective real-time logger providing temperature, humidity, and location information utilizing GSM cellular technology. Shipments are tracked worldwide using DeltaTrak’s ColdTrak 24/7 cloud service. Reliable up-to-the-minute information can be accessed securely anywhere with user login and password on a standard web browser using a PC or any internet-ready device. Using the same cloud-based dashboard, the next generation FlashLink Reusable Real-Time Mini Data Logger monitors truck cool down. The logger alarm limits can be set to loading temperature and an alert will be sent so that dock supervisors know which trucks are ready, and improve efficiency by streamlining the loading process. 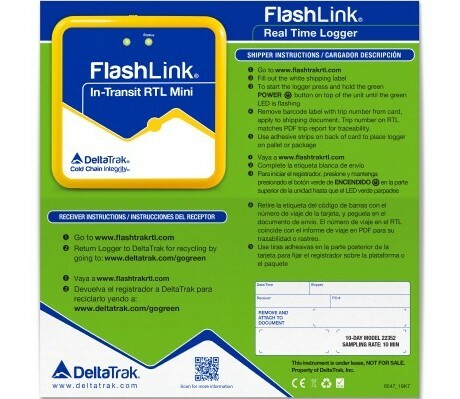 For the in-transit logger, DeltaTrak offers two models, one for most domestic shipments with a 15-day logging duration and data uploaded every 10 minutes, and a second model for longer trips with a 60-day logging duration and data uploaded every 60 minutes, ideal for export shipments. For the reusable logger, shippers can program their own trip duration and logging intervals. The ColdTrak web portal provides enhanced features and allows growers and shippers the option to upload documentation and archive data for FSMA, HACCP and regulatory compliance. Customers can customize high/low alarm settings, and alerts are automatically sent when out-of-range conditions occur. The FlashLink In-Transit Real-Time Mini Logger is mounted on a highly visible shipping card which makes the units easy to locate inside a trailer or container. Each unit comes charged and ready-to-use. Shippers can simply start the logger with the one-button activation and place it in their loads. The FlashLink Reusable Real-Time Mini Data Logger is enclosed in a durable case which protects the logger from external elements in a truck. The FlashLink Real-Time Mini Loggers are a great solution for anyone that needs up-to-the-minute information on the temperature, humidity, and location of their products. For a demonstration, please visit Hall 23 / A-17 at Fruit Logistica 2019.